February 10, 2014: Stage drapes in contact with stage lighting catch fire at Rancho High School in North Las Vegas, NV. February 19, 2014: Electrical fire at the Harris Theatre for Music & Dance in Chicago, IL destroys fire sprinkler control panel. Water seeped into the panel causing the short and subsequent fire. March 6, 2014: Stage curtains caught fire at Olympus Junior High School, in Holladay, UT. March 20, 2014: Improperly disposed rags used in staining a table started fire that destroyed scenic and prop storage for Woodstock Theatre in Woodstock, ON. March 29, 2014: Phoenix Theatre & Studios in Lewes, UK, destroyed in minutes by fire during setup for a private event. April 10, 2014: Dumpster fire causes heat and smoke damage to the roof and loading dock of Triad Stage’s production shop in Greensboro, NC. Fire caused by discarded cigarette. May 10, 2014: Evening fire in “social room” across a hallway from theatre results in evacuation of Proviso East High School theatre in Maywood, IL. June 1, 2014: Fire at Shakespeare By the Sea’s Park Place Theatre in Halifax, Nova Scotia damages exterior and roof. June 6, 2014: Subwoofer catches fire after Cheap Trick concert at American Music Theatre in Lancaster, PA.
July 23, 2014: Great Plains Theatre in Abilene, KS destroyed by fire following a lightning strike. September 11, 2014: Welding spark ignites “46 years worth of lint” in ductwork during renovation of the Alley Theatre in Houston, TX, resulting in a 2 alarm fire. September 12, 2014: Mudlark Public Theatre in New Orleans, LA receives smoke and water damage following fire at proprietor’s upstairs apartment. October 11, 2014: Early morning fire in an electrical panel at the Birmingham Hippodrome in UK was quickly extinguished by sprinklers, but 5,000 liters of water needed to be removed before ballet performances could begin. November 18, 2014: Fire at Haltrom High School in Texas started by students inexplicably trying to undo a knot in a stage rope by burning it. Fire then spread to a backdrop. November 25, 2014: Copenhagen theatre Sort/Hvid heavily damaged by fire. December 4, 2014: Xinjiang Theatre catches fire during construction in Changji, China. 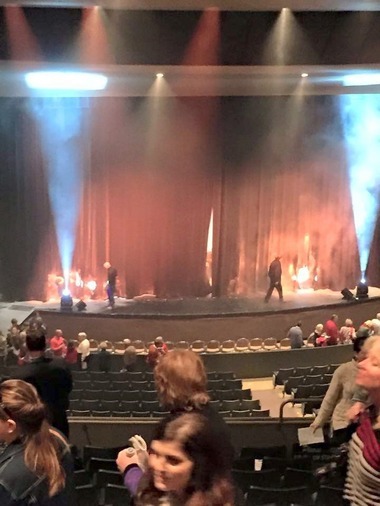 December 21, 2014: Main drape catches fire on opposite sides of the stage during a performance of Cirque Dreams Holidaze in the Mark C. Smith Concert Hall at the Von Braun Center, Huntsville, Alabama. Reports indicate that the curtain was owned by the venue and came into contact with the stage lights. No word on how long between initial contact and ignition. 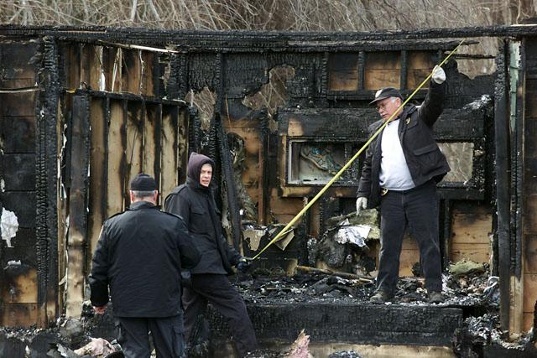 Because of fires like these, and the fact that the deadliest fires in our country's history have been in theatres, fire marshals and inspectors in the US are the most demanding. Turning Star develops specialized fire retardant products and services to bring your public space or live event into compliance with California and New York City fire code, the toughest in America. Contact us to learn how we can help you with flame retardant treatment and application, flame testing and fire certification.